So the trend continues as yet another YA fantasy series is optioned for film – are there even any left? This one is called “Septimus Heap” and is written by Angie Sage. Originally, it was a trilogy, then it was supposed to be five books, and now it’s a seven-part series… Anyways, Warner Bros. Pictures who has been producing the Harry Potter movies has picked up the rights, and the first book in the series, “Magyk”, will be produced by Karen Rosenfelt (The Devil Wears Prada). For more info on the internationally best-selling “Septimus Heap” and Angie Sage, check out the official websites HERE (US) + HERE (UK). Not to be outdone, Walden Media of The Chronicles of Narnia / Bridge of Terabithia fame as well as the forthcoming The Dark is Rising, The Waterhorse: Legend of the Deep and Mr. Magorium’s Wonder Emporium, has secured the rights to “Savvy”, Ingrid Law’s debut middle-grade novel about supernatural-powered teens, which will be published in Summer 2008 via Dial Books for Young Readers in partnership with Walden Media. On the subject of Walden Media, trailers were recently released for three of their upcoming films. First, you can check out the trailer for The Dark Is Rising HERE. I haven’t had the pleasure of reading the books, but in my opinion, the movie doesn’t look too impressive. Additionally, both The Waterhorse: Legend of the Deep and Mr. Magorium’s Wonder Emporium are aimed toward children and aren’t films I’ll be rushing to see. If you’re interested, you can check out trailers HERE (Waterhorse) + HERE (Magorium). While we’re talking about movie trailers, there’s been a bunch of them released the past couple of weeks, and some of them actually look pretty good. 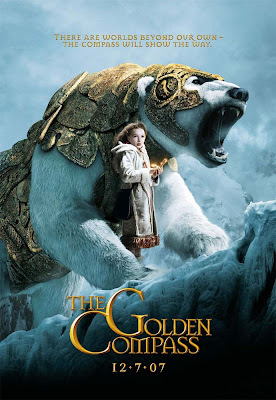 The one that has me the most excited is probably New Line Cinema’s adaptation of The Golden Compass starring Nicole Kidman & Daniel Craig (Casino Royale), which is based on the first book in the YA trilogy His Dark Materials by Philip Pullman. I thought the trailer was great, and it looks to stay fairly true to the material. Of course we’ll have to wait and see in that regard. Another film that I'm really looking forward to and which has been announced for awhile is Paramount Pictures adaptation of Neil Gaiman's graphic novel Stardust, starring Robert De Niro, Michelle Pfeiffer, Claire Danes, Peter O'Toole, Ian McKellen, Sienna Miller and many more. The film opens August 10, 2007, you can view the trailer HERE and read an advance review HERE. Then there’s The Spiderwick Chronicles trailer HERE, which previews the film adaptation of the children’s fantasy series by Holly Black & Tony DiTerlizzi, and stars Freddie Highmore who seems to love these types of films (Finding Neverland, Charlie and the Chocolate Factory, Arthur and the Invisibles). This one looks more for kids, although there might a dark streak in it. Of more interest to me was the TRAILER for Hitman, based on the cool videogame franchise about a professional assassin who gets caught up in a conspiracy. While it’s more of a teaser than anything, it does look promising. Hitman stars Timothy Olyphant (Deadwood, Live Free Or Die Hard) + Dougray Scott (Mission Impossible II). 10,000 B.C. is the latest big-budget spectacle from Roland Emmerich (Independence Day, Godzilla, The Day After Tomorrow), and like his previous movies, don’t expect much storytelling. It’s a shame really, because the premise is really cool – battling saber tooth tigers and prehistoric predators – and if someone like Mel Gibson were to direct it, I think it’d be something to see. Anyways, you can check out the trailer HERE. For fans of King Arthur and the legend of Excalibur, The Last Legion explores the truth behind the myth and stars Colin Firth & Sir Ben Kingsley. The film is based on the book by Italian historical novelist Valerio Massimo Manfredi (Alexander Trilogy) and you can see the trailer HERE. Personally, I love Arthurian stories, but this movie looks like a campy made-for-TV flick. Backtracking a bit, it looks like the franchise for “Tunnels”, a series of sci-fi/fantasy teen novels by Roderick Gordon & Brian Williams, has been optioned to Relativity Media (Smokin’ Aces, Ghost Rider) for film adaptation. The first book in the series, originally titled “The Highfield Mole”, was recently released in the UK and will be made available in the U.S. on January 1, 2008. You can check out an excerpt from the Harry Potter heir apparent HERE. Lastly, Chuck Palahniuk (Fight Club, Lullaby, Rant) fans should be happy to know that the movie version of the author’s first bestseller “Choke” is moving nicely along with Sam Rockwell and Anjelica Huston starring.